A 27-year-old Dublin criminal has emerged as the chief suspect in an extremely violent aggravated burglary in the North which left a pensioner fighting for her life. Gardai have also seized a vehicle linked to the investigation into the incident. 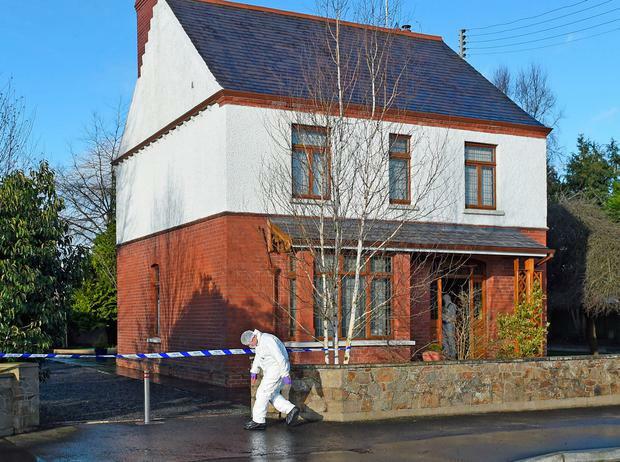 Pat Davidson (83) suffered a fractured skull, spine and pelvis when a four-man gang raided her home in Aughnacloy, Co Tyrone, last Tuesday night. A senior PSNI detective said they were treating the incident as attempted murder and the force was liaising with gardai after a vehicle with a fake Wexford registration plate was used by the gang. The Herald can reveal that a prolific burglar from the Tall-aght area has emerged as a chief suspect. Investigators received information that the criminal's car was in the Aughnacloy area before the gang broke into Ms Davidson's home. The vehicle's details and registration number were given to PSNI officers, who also passed on the information to their garda colleagues. In the days after the break-in, the burglar was arrested following a high-speed chase that ended in a Co Kildare town. After being detained in relation to that pursuit, the garda's automatic number plate rec- ognition system alerted off- icers that the car was being sought in relation to the Tyrone burglary. The car has since been seized to be examined, and while the man has not been formally arrested in relation to the PSNI investigation, sources told the Herald that he is being treated as a chief suspect. Detectives are also continuing to appeal for information about two other vehicles, a dark-coloured car with registration number GK56 AEG and a silver-coloured car, possibly a Ford Focus, with registration number 06WX 6313. The suspect is a member of a Traveller gang but is not a Traveller. He has previously served a jail term after threatening a garda detective, and has a string of convictions for burglary-related offences. Ms Davidson was placed in an induced coma and is continuing to be treated in hospital. A young mother said she found the pensioner screaming in pain while lying below an open upstairs window. "Two people walking past said they'd seen four men jumping over the wall into the car, so we knew something bad had happened," said Cody Morrison (21). The suspects made off in a black car in the direction of Moore Street. Detectives are linking the raid to three other burglaries, also near the border, on Tuesday. They believe the criminal gang could have travelled from the Republic. The other burglaries happened at Aghaloo Close in Aughnacloy, Richmond Park in Ballygawley and McDowell Terrace in Seskinore.